If you were born before, oh, 1970 or so, you had an English teacher who swooned over Henry Wadsworth Longfellow. That teacher may have even made you memorize one of that poet’s most famous works. See if this seems familiar… Listen, my children, and you shall hear/Of the midnight ride of Paul Revere,/On the eighteenth of April, in Seventy-Five;/Hardly a man is now alive/Who remembers that famous day and year. Since the day and year Longfellow mentions was April 18, 1775, his assertion that hardly a man is still alive is factually correct. That’s one of the few things in the poem that is true. This being the 234th anniversary of the event, I thought it might be worth comparing the poem to what actually happened. First of all, Paul Revere did ride that night, but he wasn’t alone, as Longfellow suggests. 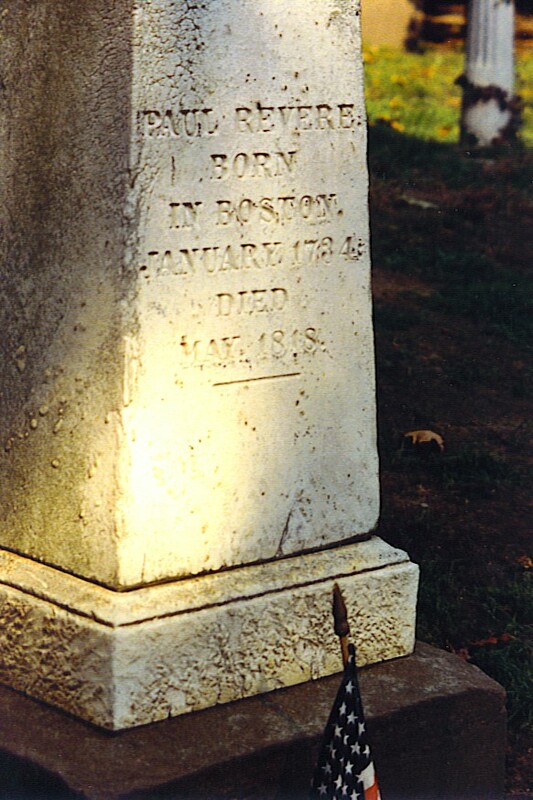 There was a second rider, by the name of William Dawes. They were both headed for Lexington, a town about ten miles southeast of Boston. The objective was to warn John Hancock (later famous for insurance and signatures) and Samuel Adams (Mmm, wouldn’t a cold Samuel Adams go good right now?) Those two needed to be alerted that the king’s soldiers were headed to Lexington to arrest them. Paul Revere did arrange for the sexton of Old North Church to signal with lamps from the steeple: “one if by land”, as the poem says, and “two if by sea”. But Longfellow got it wrong on a couple of counts. Two if by sea? What sea — the Red(coat) Sea? It was actually “two if the soldiers are crossing the Charlestown River to head for Lexington.” Furthermore, the signal wasn’t for Revere, it was for the benefit of the colonists in Charlestown, in case both Revere and Dawes got captured. In other words, the steeple signals were a sort of Plan B — Paul Revere had already ridden, and, by a different route, so had William Dawes. Not long after they left Lexington, Revere, Dawes, and Prescott got stopped at a roadblock by the king’s troops. Dawes escaped by jumping his horse over a low wall, but shortly thereafter he fell off his horse and was done for the night. Paul Revere was detained at gunpoint for questioning. Dr. Prescott escaped and was the only one of the three who made it to Concord to warn the militia there that trouble was on its way. Incidentally, as he rode through Middlesex County, Paul Revere did not yell “The British are coming!” According to his own later account, what he said was, “The regulars are coming out!” At that point, most colonists still thought of’ themselves as British, so they wouldn’t be alarmed that the British were coming; if they heard somebody hollering that, they merely would have wondered how much that loudmouth on horseback had to drink. I’m not suggesting that Paul Revere didn’t do anything important that night — he certainly did. It’s just that he doesn’t deserve all the credit. And I suppose you can’t blame Longellow for making a hero out of Revere at the expense of the others. It was just the rotten luck of Willam Dawes that his name didn’t make for stirring rhymes: flaws, in-laws, coleslaw… Nah.